He's a Brazilian artist, obviously, and this is his African funk exploration. My introduction to the record was the first song, which I found on a Brazilian compilation, 'Ponta De Lanca Africano'. I have played that record out so many times when I've DJ-ed. It's just super-funky and kind of psychedelic, and really catchy. But the whole record is really an exploration of that same kind of sound. I love Brazilian music and I was introduced to a great deal of it by my friend Joel Stones, who had a store in New York called Tropicalia In Furs. I don't know if you ever made it there but it was an incredible place. He specialised in Brazilian music, being Brazilian, but also so much more. I would just spend hours in there and Joel is just everything you want in a record store proprietor. Deep enthusiasm, never wanting you to leave, always wanting to play you something else that will blow your mind; he knows he has the goods and he loves nothing more than to get you excited about music. It's really the best feeling and it represents everything a record store should be. So a great deal of my education as pertains to Brazilian music comes from Joel, and he opened a lot of doors in regard to the psychedelic and the funky aspects of that music, from the late sixties and on to the seventies. 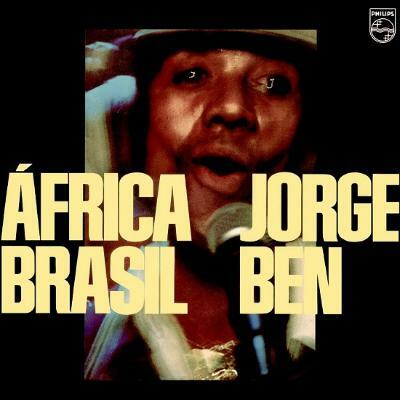 And Jorge Ben is obviously a staple of that, and this record is probably my favourite collection of songs from him.